Holy Martyrs Church’s name recognizes modern-day martyrs, particularly those who were killed in El Salvador. Founded in 1980, our church was named to honor El Salvador martyrs: Saint Oscar Romero of El Salvador, assassinated while celebrating Mass in San Salvador in 1980, and the four churchwomen – Sr. Dorothy Kazel, Jean Donovan, Sr. Ita Ford and Sr. Maura Clarke – who were also killed in 1980 while serving in El Salvador. Holy Martyrs Church has embraced each of them as the special martyrs that have given our parish its name. The women are profiled on the walls of four rooms on the mezzanine level above our Gathering Area and our small chapel is named for Saint Romero. 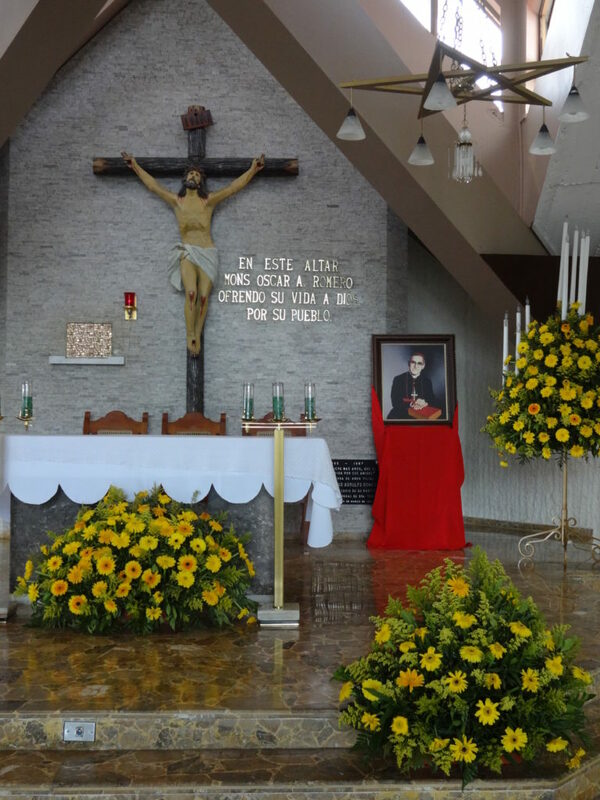 Holy Martyrs Church honors its namesakes through a special ministry to the people of El Salvador. We have a sister parish relationship with Immaculada Concepcion in La Libertad, El Salvador, where Donovan and Kazel served with Rev. Paul Schindler of the Cleveland Diocese. Our primary El Salvador Mission goal is to provide scholarships for selected students to attend a trade school or college/university in El Salvador. We provide funds for students’ education through an annual “Fore” the Kids golf fundraiser. Each January, we also take a group of parishioners on a pilgrimage/immersion trip to El Salvador.